Has Utah State University found long-lost prehistoric figurine? 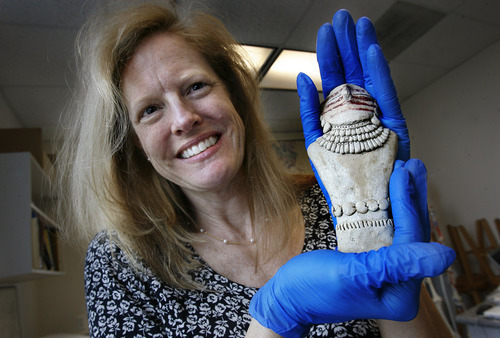 USU studying whether anonymous gift is a long-missing artifact. Scott Sommerdorf | The Salt Lake Tribune The full collection of figurines being examined at Utah State University. The figurine that was recently turned over to the university is at far left in the second row of this group. It is thought to be a pair with the one to the right of it. Bonnie Pilblado and her staff at USU are working to determine if it is actually the long-lost artifact from the Pilling Figurines collections, originally recovered in Range Creek in 1950. Scott Sommerdorf | The Salt Lake Tribune Staff assistant Holly Andrew holds the figurine turned over to Utah State University on Thursday. She shows the underside of the figure, which reveals the marks left by a woven basket that indicate it matches others in this group. 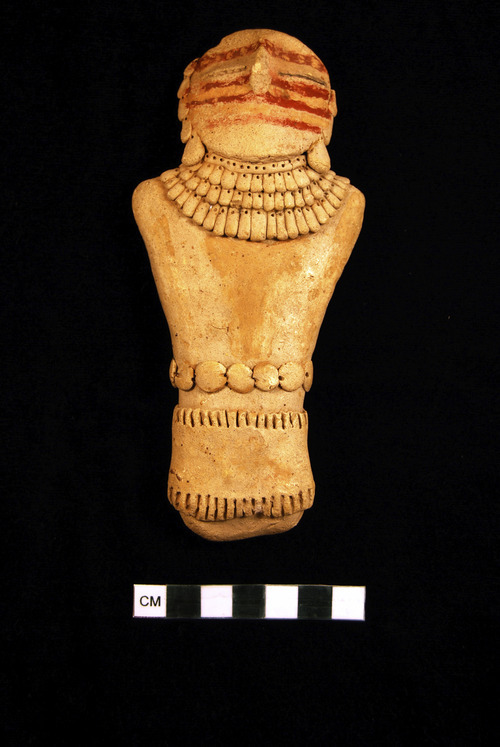 Bonnie Pilblado, the curator of USU's Museum of Anthropology, is leading the scientific investigation into whether the figurine is actually the long-lost artifact from the Pilling Figurines collections, originally recovered in Range Creek in 1950. Scott Sommerdorf | The Salt Lake Tribune Bonnie Pilblado, left, the curator of USU's Museum of Anthropology, works with Staff Assistant Holly Andrew as they examine the figurine recently turned over to the Anthlopology Dept. at Utah State University. Pilblado is leading the scientific investigation into whether the figurine is actually the long-lost artifact from the Pilling Figurines collections, originally recovered in Range Creek in 1950. Scott Sommerdorf | The Salt Lake Tribune Bonnie Pilblado, the curator of USU's Museum of Anthropology, is leading the scientific investigation into whether a figurine that was recently turned over to the university is actually the long-lost artifact from the Pilling Figurines collections, originally recovered in Range Creek in 1950. Scott Sommerdorf | The Salt Lake Tribune Bonnie Pilblado, the curator of USU's Museum of Anthropology, is leading the scientific investigation into whether a figurine that was recently turned over to the university is actually the long-lost artifact from the Pilling Figurines collections, originally recovered in Range Creek in 1950. Scott Sommerdorf | The Salt Lake Tribune Bonnie Pilblado, the curator of USU's Museum of Anthropology, holds the figurine recently recently turned over to USU on Thursday. Pilblado is leading the scientific investigation into whether the figurine is actually the long-lost artifact from the Pilling Figurines collections, originally recovered in Range Creek in 1950. Scott Sommerdorf | The Salt Lake Tribune A partial view of the collection of figurines being examined at Utah State University Thursday. The figurine that was recently turned over to the university is at far left. It is thought to be a pair with the one to the right of it. Bonnie Pilblado and her staff at USU are working to determine if it is actually the long-lost artifact from the Pilling Figurines collections, originally recovered in Range Creek in 1950. Photo courtesy Holly Andrews, Utah State University A team of scientists led by USU anthropologist Bonnie Pitblado is investigating whether this object, anonymously given to the university last year, is a long-lost Pilling figurine. One of the clay pieces from this priceless collection, held by USU-Eastern's Prehistoric Museum in Price, went missing years ago. Rancher Clarence Pilling discovered a trove of 11 figurines in Range Creek in 1950. 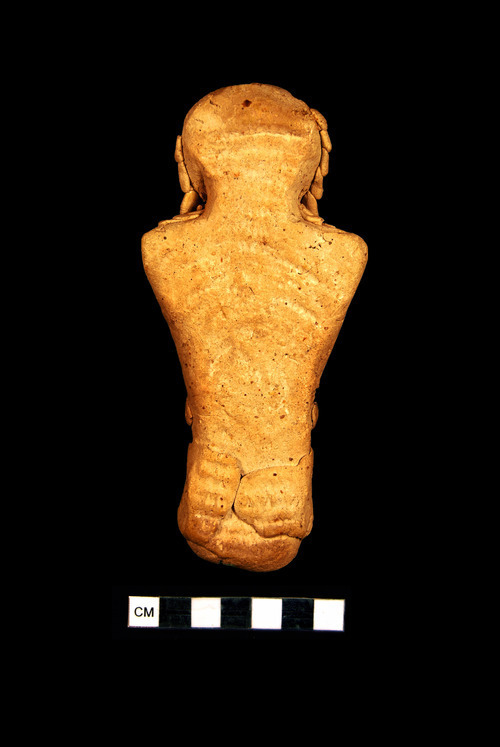 Photo courtesy Holly Andrews, Utah State University A team of scientists led by USU anthropologist Bonnie Pitblado is investigating whether this object, anonymously given to the university last year, is a long-lost Pilling figurine. One of the clay pieces from this priceless collection, held by USU-Eastern's Prehistoric Museum in Price, went missing years ago. Rancher Clarence Pilling discovered a trove of 11 figurines in Range Creek in 1950. 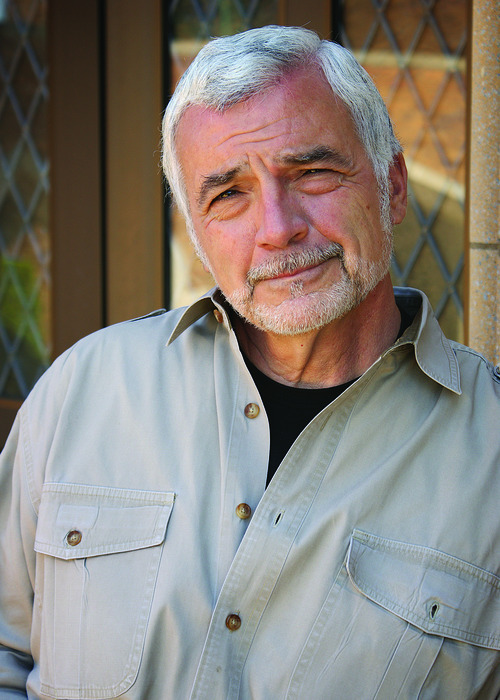 Anthropologist Jim Adovasio, provost of Mercyhurst University in Pennsylvania, is a leading expert on ancient North American basketry. 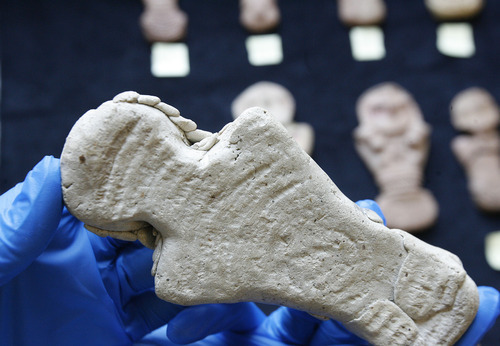 He is helping authenticate an artifact believed to be the long-lost Fremont figurine from the famed Pilling collection held by the Prehistoric Museum in Price. Photo courtesy Holly Andrews, Utah State University Rear view of an artifact believed to be the long-lost Pilling figurine. One of the clay pieces from this priceless collection, held by USU-Eastern's Prehistoric Museum in Price, went missing years ago. Rancher Clarence Pilling discovered a trove of 11 figurines in Range Creek in 1950. Scott Sommerdorf | The Salt Lake Tribune Anonymous note accompanied the figurine that was recently turned over to Utah State University. Anthropology professor Bonnie Pilblado and her staff are working to determine if it is indeed the the long-lost artifact from the Pilling Figurines collections, originally recovered in Range Creek in 1950. Scott Sommerdorf | The Salt Lake Tribune Bonnie Pilblado, left, the curator of USU's Museum of Anthropology, works on Thursday with Staff Assistant Holly Andrew as they examine the figurine recently turned over to the anthlopology department at Utah State University. Pilblado is leading the scientific investigation into whether the figurine is actually the long-lost artifact from the Pilling Figurines collections, originally recovered in Range Creek in 1950. Last year, Bonnie Pitblado received a striking piece of ceramic art in a small box with a typed note that expressed the anonymous sender's desire for the artifact to "find its original home." One look and the Utah State University anthropologist knew the fist-sized figurine appeared very much like a treasured Fremont artifact that went missing nearly a half-century ago. But what if the piece were a clever fake? Pitblado wanted to make certain the piece is the one missing from the famed Pilling Figurines, one of North America's most prized collections of prehistoric portable art. 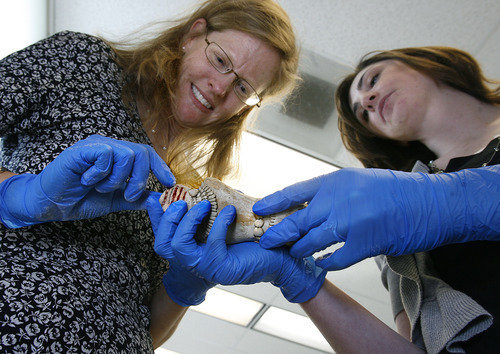 For the past six months, she has led an interdisciplinary effort to link the 5-inch piece to the 10 remaining figurines with help from a Salt Lake City crime lab, a world expert on ancient basketry and other scientists. The team of history detectives is close to declaring the case closed, but not until results are available from chemical analyses being conducted at Brigham Young University this week. "It's such an iconic assemblage of artifacts. 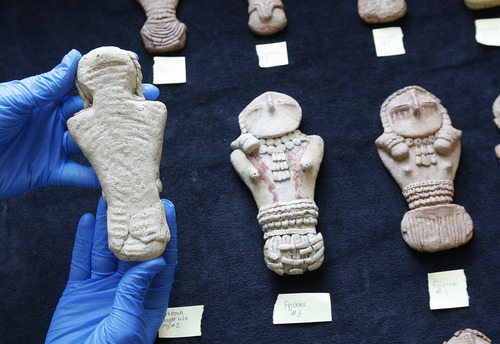 Museums want to know its provenance, where it has been and what has happened to it. Once you've broken that chain, there is usually no way to repair it," said Pitblado, the director of the Museum of Anthropology on USU's Logan campus. The figurine's recovery will bring renewed attention to the celebrated figurines, which offer a vivid glimpse of how Fremont Indians dressed and adorned their bodies 1,000 years ago, according to USU-College of Eastern Utah professor Pam Miller, the Prehistoric Museum's former curator of archaeology. On a March day in 1950, Clarence Pilling and three other ranchers were looking for stray cattle on the Pilling ranch in eastern Utah's Range Creek canyon when they saw a cave in a side canyon that sheltered a ruined structure. They entered the 12-foot recess, where Pilling spotted the figurines lying in a row on a natural shelf. The cowboys took the artifacts to Price, and Pilling entrusted them to Harvard's Peabody Museum, which published a detailed account of them in 1954. Peabody anthropologist Noel Morss concluded the figurines all were made by the same hand because they had the same stylistic quirks, such as left eye slits that are longer than the right and similar technical precision. Ten were in male-female pairings, appearing as limbless torsos. Figurine No. 2, the one that disappeared, wears what appears to be a leather skirt with fringes at the waist and at the hem, a belt, earrings, a necklace with three layers of beads covering the throat and chest. It has four horizontal red lines across its face. The Peabody museum covered the figurines with an organic material called Alvar, an adhesive intended to stabilize the delicate artifacts, according to Pitblado. BYU scientists are using a scanning electron microscope to detect this substance on the returned figurine. 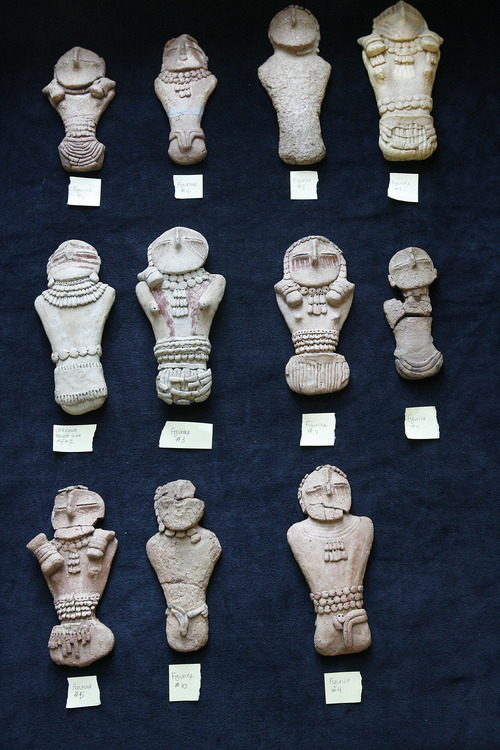 BYU geologist Steve Nelson is also using X-ray florescence, which detects geochemical signatures, to determine whether the figurines were produced from the same clay and pigment sources. The piece was lost in the early 1960s, not long after the Prehistoric Museum opened in Price, according to Don Burge, the museum's now-retired founding director. It is not clear exactly when, but Burge recalled that the collection toured for display around the state, and it returned with a figurine missing. One figurine had been broken into two parts, according to Pitblado, which meant the remaining collection still had 11 pieces. Over time, that led to confusion over whether any were missing. "The questions of whether it was missing was clouded. It was like the abandoned baby. It didn't have any label of ownership," Burge said. At the time, the collection was considered the property of the Pilling family, although it later became federal property held by the Prehistoric Museum, an official repository for artifacts recovered on federal land. The figurines are considered among the most precious in the museum's 600,000-item collection. And the missing figurine is the best in the bunch. "It's the sturdiest and well preserved. The beads were still adhered on. The missing one is the central figure," Pitblado said. One of the first details she noticed on the returned piece were fingerprints still imbedded in the unfired clay. "They were clear as day. Wouldn't it be great if the others had fingerprints? Wouldn't it be a fun to work with a crime lab to see if we could match them?" Pitblado said. Salt Lake City criminologists examined the pieces, but the artist or artists had obscured their prints while smoothing the clay centuries ago, making it impossible to make a reliable match. But Pitblado did find a smoking gun: impressions left on the figurines' backs as they dried on coiled basketry. 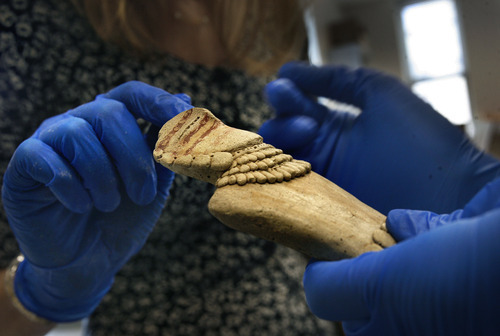 The connection was made by Jim Adovasio, a Utah-trained archaeologist recruited by Pitblado for his expertise in basketry and other perishable artifacts. He happened to be in Logan last February for a lecture, so he took advantage of the visit to study the figurines by laying them on mounds of corn starch. The fine powder captured the basketry impressions that were otherwise difficult to see on the clay. He recorded the diameter of the coil, the type and spacing of stitching and the splicing of new material, finding them consistent with the Fremont Indians' distinctive style of basketry. "That it was laid down while still wet on a Fremont basket is a certainty," said Adovasio, the provost and sciences dean at Mercyhurst University in Pennsylvania. But more telling was that the mystery figurine bore imprints that indicated it was dried on the same basket as the missing figurine No. 2's known mate. "If someone faked this they would have to have found a basket dead identical to the one used on the original and put it on in precisely the same way," Adovasio said. 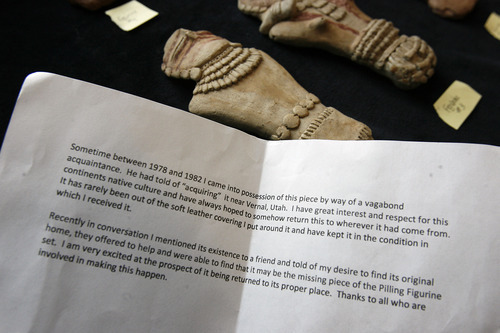 Pitblado has had no interaction with the person who had possessed the figurine, which was delivered to her through a go-between, and does not know who he or she is. Pitblado believes the person was well-intentioned but wanted to keep a low profile in light of a heavy-handed federal raid two years ago on suspected artifact looters in Blanding. 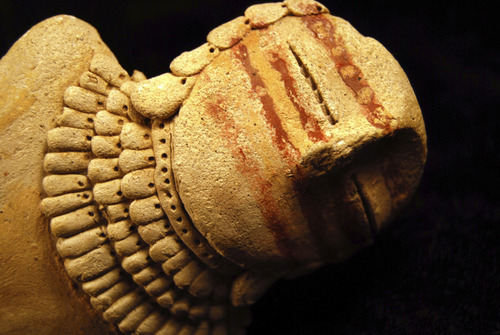 The figurine came to her in pristine shape, with the red pigment lines across the face and detailed bead work intact. The note gave only vague clues to where the piece has been. "Sometime between 1978 and 1982 I came into possession of this piece by way of a vagabond acquaintance. He had told of 'acquiring' it near Vernal, Utah," the note said. "It has rarely been out of the soft leather covering I put around it and have kept it in the condition in which I received it." Bonnie Pitblado, USU professor of anthropology and director of the Museum of Anthropology at the Logan campus, talks about the investigation she led to determine whether an anonymously donated artifact is indeed the missing Pilling Figurine. The public is invited to hear her findings. 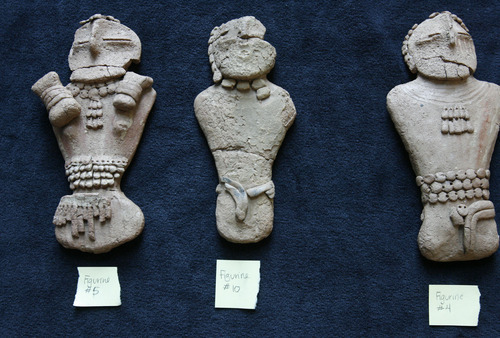 May 3 • 7 p.m. at the Moab Information Center, 25 E. Center St.
Rancher Clarence Pilling found 11 well-preserved Fremont figurines, made of fragile unbaked clay, under an overhang in Range Creek in 1950. 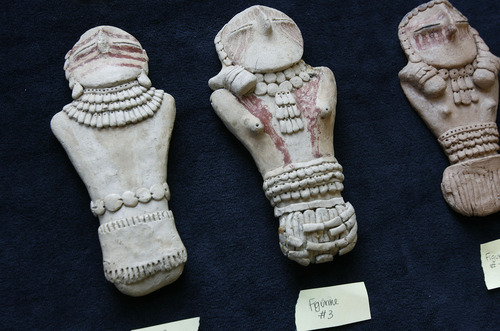 The collection, in the possession of the USU Eastern Prehistoric Museum in Price, is among the most important pieces of ancient portable art recovered in the Southwest. Made in male-female pairs, the 1,000-year-old pieces reveal how ancient Fremont Indians attired themselves. Some still bear red and blue pigments and the artists' fingerprints, which scientists have examined to solve the mystery. In the early 1960s, the central figurine disappeared. "Sometime between 1978 and 1982 I came into possession of this piece by way of a vagabond acquaintance. He had told of 'acquiring' it near Vernal, Utah. I have great interest and respect for this continents native culture and have always hoped to somehow return this to wherever it had come from. It has rarely been out of the soft leather covering I put around it and have kept it in the condition in which I received it. "Recently in conversation I mentioned its existence to a friend and told of my desire to find its original home, they offered to help and were able to find that it may be the missing piece of the Pilling Figurine set. I am very excited at the prospect of it being returned to its proper place. Thanks to all who are involved in making this happen."